The Fifth Oceania Tennis Championships kicked off at Apia Park yesterday. Ten countries are competing in this year’s tournament and are led by Australia, Cook Islands, Fiji, Guam, Federated States of Micronesia, New Caledonia, New Zealand, Tahiti-nui, Vanuatu and the host Samoa. The teams are competing in the open men’s and women’s divisions. 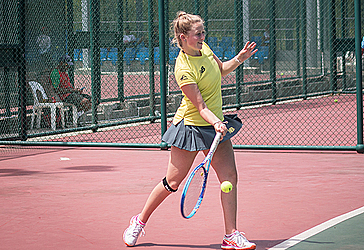 The Oceania Championships was initiated by New Caledonia Tennis and implemented by the Oceania Tennis Federation. Australian tennis player Anzac Leidig spoke of his excitement to be part of the competition. “This is my first time in Samoa and its just beautiful and very green everywhere. The culture is what we’re really interested in. “For me in tennis, the passion is overcoming so many challenges, it’s like playing tennis. Unpredictable in every way, sometimes you may win some and lose in others. But perseverance is important in overcoming any obstacles. “Samoa is very hot though, and we have to adjust in playing in these conditions but overall looking forward to this whole week’s experience,” he said in an interview with Samoa Observer. Cook Islands player Davina Hosking-Ashford also said he was excited to be in Samoa for the championship. “I am here due to my inspiration in playing for my home land Cook Islands. But other than that I play because of my passion for the sport. “The weather in Samoa is amazing; the people are lovely as well. The major sponsor for the tournament is Invest Samoa.